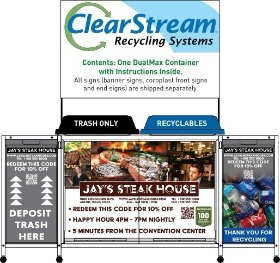 is an environmentally friendly system that will evolve with your material collection needs and revenue goals. It also makes your Operation steam more efficient. DualMax is a dual stream, indoor container. It ships with a black TRASH ONLY and a blue RECYCLABLES lid. Lids snap on to the frame at all 4 corners with an audible “click”. With 7 different hot stamped lids to choose from, DualMax evolves with your material collection needs and revenue goals.